WHEN you’re a teenage actress dreaming of stardom, it’s lovely to hear Liza Minnelli say that she envies you and what you’ve achieved. That’s one of the countless amazing memories of Annette Andre, who went on to star in just about every hit TV series you’ve ever seen, not to mention movies. “I don’t know if it was just shyness or insecurity, but she wasn’t quite like the Liza Minnelli she became,” admits Annette in an exclusive Weekly News interview. In some ways, it was a premonition, as Annette did indeed head to Europe by herself, and built an incredible acting career in England pretty much through her own willpower and talent. From The Heroes Of Telemark to The Avengers, from Adam Adamant Lives to Up Jumped The Swagman, Crossroads and The Prisoner, she would fill our small and big screens for many years. Now she has published a fascinating autobiography, Where Have I Been All My Life, and is doing one-woman shows in which she discusses her career and life. One star who would have done anything to be an even bigger part of her life was the late, great Benny Hill – the comic, loved across the globe, idolised Annette and she was the love of his life, even if it was unrequited. “Benny became a very dear friend,” Annette reveals. “He took me out in Australia a few times, saying he loved to go to different places for lunch. “We would chat and he made me laugh, but then he would talk to me fairly seriously. He didn’t treat me like I was a 20-year-old. In some ways, he wasn’t much older, but very reserved and shy. “It was a meeting of souls, and he told me: ‘When you come to London, you must get in touch, and I will give you work.’ That was quite true. “He’d take me to dinner, and there was never any semblance of romance. I knew he liked me, but he never gave anything away until one day. I was standing up when he told me, and I had to hold on to the door frame to stay there. “It was a surprise and I didn’t know how to handle it. But in his own way, he pretended it was all fun, just a bit of joke. I didn’t realise just how much it affected him. As she says in her book: “Apparently, Benny never got over my rejection. He couldn’t watch me on telly, switching to another channel. When he had a heart attack years later, I asked if I could come over, but he said no, he wasn’t well enough for that. Her upbringing Down Under had left the young Annette decidedly naïve when she came to England. As she admits, she also got tongue-tied and maddeningly shy in the company of famous folk. Help arrived from Barry Linehan, the Irish-born comic and actor who is remembered for Coronation Street among many other things. “I loved Shirley Bassey’s work, and I had the pleasure of meeting her,” she explains. “She did a show with my friend Barry Linehan, who knew her, and after the show, they were going to dinner and invited me a couple of times. “That was when Barry said to me: ‘You just sit there like a lemon all night! You’ve got to be able to talk!’ I tried telling him that I couldn’t, that I just didn’t know how to join in with these people. One superstar she talked to was Paul McCartney. Annette shared a flat with his then-girlfriend, Jane Asher, and got to chat to the Beatles legend. “We went up to Glasgow to do a TV series, and he used to phone Jane every night at 11 o’clock,” she reveals. “She always made sure she was back to take the call, but one night, we were late and she went out to the shops for a minute. I answered his call and had a quick chat with him. “They were obviously keen on each other, and she was full steam ahead, so I suppose I assumed they’d marry. Tony Curtis and Herbert Lom, on the other hand, weren’t always the sort of gents you could enjoy a long, enthusiastic chat with. “We went to a big party and Herbert Lom was sitting there at a table all on his own, surrounded by people, but we never saw him talking to anyone. “He was a nice man, not mean or anything, but he just didn’t seem able to deal with other people he didn’t know well. “With his fellow actors, he didn’t take the time to get to know you. Sweet to work with, but when the work was done, he just walked off the set. “Tony Curtis was two people, I found. There was the person you saw on the outside, the film star, cocky and brash and American, Brooklyn and all that sort of thing. “Then there was Tony the actor, he was quiet, disciplined, deep and soul-searching, wanting to talk with you about the characters, and it wasn’t exactly Tolstoy! She also bonded, to a point, with film legend Buster Keaton, though Annette agonisingly stopped herself behaving like a fan, and now wishes she had! This was in A Funny Thing Happened On The Way To The Forum, Keaton’s last film. “I talked with him a lot,” Annette says. “He would be off set, waiting to do his scenes, even when he wasn’t needed too much. “His wife was there and very careful with him. Buster was ill, and having to have oxygen. “He would go out and run on the spot with the unit while the chariot was racing around. He was 85, and he would fall down after it. “Everybody loved him, and he made a big deal of talking to me. “I think he realised I was shy, and he made life very warm and brought me into the fold. One thing that was hard to get used to was “freezing”. One half of Randall And Hopkirk was deceased, of course, and in those days before computer trickery was available, they had to resort to other means. 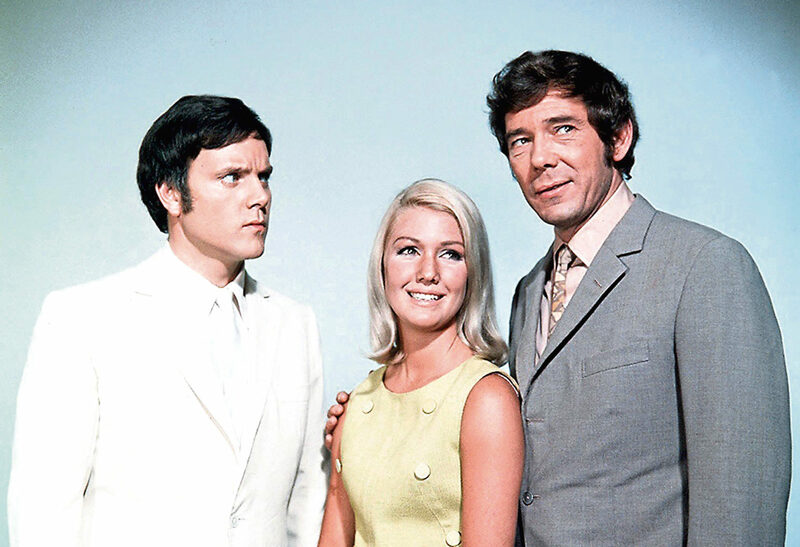 Annette and the others would be halfway through a scene, and then have to suddenly stand stock-still, while the “Ghost” Marty Hopkirk, played by Kenneth Cope, was added to the scene. Liza Minnelli was right – the amazing Annette Andre really has had a career and life well worth envying.